Just going to talk about a few items in the kitchen. The round "tins" on the bottom shelf and canister set on the counter. These were made from card stock. I use a wood dowel for the forms, choose the diameter you want for the size of "tin" you want. I find 3/4" dowels make a nice size tin. They come in all sizes, you choose the size of dowel you need. Take a length of sewing thread, grey if you have it, and run it through your fingers full of silver paint. Get the thread covered, hang the thread to dry. Do enough to go around the tin twice. I do this the night before to be sure that the thread is dry. The tin I'm copying is 2 1/2" tall. I'm going to cut a strip of card stock 7/32" wide and 2 5/8" long. Wrap it around the dowel, overlap the ends and glue with Elmer's white glue. Be careful not to glue it to the dowel. Let dry. When dry, sand the seam a bit to soften the joint. Do you want to have a tin that opens? You can fill with cookies, candies or like mine, a button box. For the lid I like a pattern. There are lots of Dover Books that have copyright free designs and patterns. There are catalogs full of pictures that can be used. You can make your own on the computer. Or you can paint the lid. Small print calico is a good source, you can copy it on to card stock. Cut a strip of card stock or your patterned paper that's been glued (with glue stick) onto card stock, 1/16" wide and 2 5/8" long. Wrap this narrow piece around the already glued strip that is still on the dowel. Carefully glue the lid strip to itself. Don't let glue go onto the bottom strip or you won't be able to open your tin. Let dry, testing occasionally to see that it is not glued to the bottom strip. Push the lid strip slightly off the dowel, not all the way. Leave the bottom strip where it is. Cut a circle, a little larger in diameter than the dowel, from your patterned paper/card stock. Apply Elmer's white glue to the edge of the lid strip and set the circle (top) onto the glued edge. Let dry. When dry, carefully trim around, cutting close to the edge. I use curved scissors for this. Take the completed lid off the dowel. Cut another piece of card stock a little larger than the diameter of the dowel. Push the the bottom strip slightly off the dowel, not all the way. Apply Elmer's to the edge and set the bottom circle onto the bottom strip. Let dry. When dry carefully trim off the extra card stock. You can paint the bottom tin, I use Delta's PermEnamel, to coordinate with your patterned top. Let dry. To make the rolled edges apply tacky glue in a very narrow line along the bottom edge of tin and apply the thread along this glue line. Let dry. Do the same thing with the bottom edge of the lid. The canister set is made the same way using graduated sized of dowels. To make the floor I first made a pattern and then cut a floor from poster board. I found something I liked from a "Better Homes and Gardens" 1940's magazine. I painted the whole surface dark blue, I used a little roller I found at Home Depot. You can use a foam brush, too. This time I used Delta's Ceramcoat. I let this dry. I marked off the border, it's about 5/8" and left an 1/8" space and masked another line about 1/8" wide. I used painter's blue tape. Then I sponged, I'm a great sponger, that's my answer to everything, "Sponge it". I used 2 shades a little lighter that the orignal blue plus white. Let this dry. Then according to the picture from the magazine I painted a little blue square, a yellow circle and 2 red lines. It's not much, but it gave the kitchen a 1940's feel. Take the blue tape off. I finished the floor with Delta's PermEnamel Clear Gloss Glaze. I made the clock radio from polymer clay. The metal ring around the dial is a rim from a "Gripper" snap from the notions department in a sewing store. I use these for sink drain rims, too. The dial is a barometer face from a clock catalog. The cabinets do not open. They are all boxes with doors glued on the faces. They are made from basswoood. The handles are drinking straws I painted silver. I snipped off small rings, trying to keep them all the same width, then I cut the rings in half, there's your handle. I glue them on with super glue. I painted the counter tops dark red. The old counter tops were covered with linoleum, some didn't have back splashes. I finished them with Delta's PermEnamel Clear Gloss Glaze. The edge of the counter tops is made from silver foil from a stained glass store or supplier. It's narrow, just the right size for the counter top, you can fold it over the top and bottom. This comes on a roll and is sticky. It looks just like the aluminum edge that used to make the front of our shirts black! Going to make the sink top next. This is the picture of the stove I copied for the Kitchen Room Box. It's from "Better Homes and Gardens", April, 1941. I find these magazines at antique malls, it's good to have a few. I would really like to have some magazines from the 1920's, but those are hard to find and cost more. This stove will be made from basswood. It is painted with oil base enamel. I paint, sand, and paint again until I get a smooth finish that looks likes porcelain enameled metal. I don't make my appliances open, I don't think I could get them to look realistic if I made them to open. I'm just interested in making them "look" realistic, anyway. 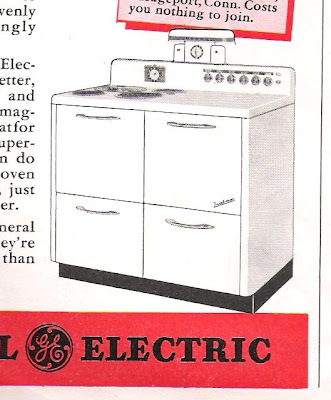 If you don't like this style of stove, get on the Internet and type in "vintage stoves". You'll get some beautiful examples, with measurements. I make my appliances first, then I fit my countertops to them. Sometimes when I scale the measurements down I will round off the fractions to make it easier. This stove is 3 1/4" wide, 2 1/2" high and 2" deep. Use wood glue for everything, until I mention the tacky. First you will need a block of wood measuring 3 1/16" wide, 2 9/16" high and 1 13/16" deep. This can be a solid block of wood or you can stack basswood and glue & clamp together any combination that will get you to 2 9/16" thick. If you are stacking, rough cut pieces about 3 1/4" x 1 3/4", glue & clamp 3 to 4 pieces together, let dry them cut 3 1/16" x 1 13/16". Then glue & clamp, using wood glue, your stacks together, KEEPING EVERYTHING VERY EVEN. Let dry. Cut a bottom, this is the toe kick, 3 1/4" wide, 1 5/8" deep and 3/8" high. This piece is not as deep as the block, that's for the toe kick. This piece is 3/16" wider than the block, that's because we are going to add sides to the block, each side 3/32" thick. Glue & clamp the bottom onto the block, keep the backs even, 3/32" on each side and 3/16" back from the front. Soften the 2 front corners of the bottom by sanding. Cut a back 3 1/4" wide and 3" high from 3/32" thick basswood. Round off the 2 top corners. Glue & clamp this onto the back of the block/bottom assembly. The back will have 3/32" extra on each side and 1/2" extra on top for the back splash. Divide the top in half and center 4 circles, 3/4" in diameter on the left half. Cut or drill these out. Place the top on the block and mark your circles. Remove top and paint the marked circle areas on the block silver. Let dry. Glue & clamp onto block. Doors. Cut 2 from 3/32" stock: 1 1/2" x 1 1/2"; and cut 2 from 3/32" stock: 1" x 1 1/2". Sides. Cut 2 from 3/32" stock: 2 9/16" x 1 29/32". For the light on the back use 3/32" stock and cut 1 piece 1/2" x 1/2". Cut a 3/8" dowel 1 1/8" long. The safe way to do this next step is to sand this dowel flat, in half, and round the ends, like the shade in the picture. If you have a Dremel with carving bits, you can hollow out the shade, but you don't have to. Using fine sandpaper soften the front and side edges of the top. Soften the front edge of the back splash. Soften the front outside edge of the sides, only. Soften all four sides of the doors. Glue the 1/2" x 1/2" piece to center edge of back splash. Let dry. Glue the shade onto this piece. Let dry. Mask off the silver painted holes in the top. Using oil based enamel, I use white Rustoleum, paint the top, top and front of back splash white. Paint the sides and doors white, paint both sides to seal and prevent warping. Paint the bottom and the block all around and the back with black enamel. Paint it all again, black and white. You only have to paint the fronts of the doors from now on. Let dry. Sand using fine grit sandpaper, 220. Paint it all again and sand with finer grit paper, I'll go up to 400 grit. You are looking for a glass smooth finish, when you are satisfied, stop. Don't sand again. I will sometimes paint and sand 7 or 8 times until I get a finish I like. Something always gets on the wet paint, somehow, I don't know. Glue on the sides and the doors. If you clamp, be careful, don't use much pressure, and put something between the wood and the clamp. If you don't it will leave a mark and you'll have to sand and paint again, Oh no! I used the centers of round plastic canvas cut to size and painted black for the burner grates. For the knobs you can use poster board stacked and glued together for the right thickness or polymer clay. Cut 9 circles, 1/16" to 1/4". Cut 3 of them less than in half and place cut edge onto middle of the circles. Bake according to package directions. Or glue the 1/2 circles onto the circles. Paint the color you want. You can use tacky or super glue to glue these on. I found clock dials on line at clock making websites. Size the dial the size you want, I glue it to a thin circle of wood or posterboard a little bigger and painted silver to look like a rim. Then I'll coat with a finish to make it all shiny. Glue this on with tacky or super glue. The handles for the doors are cut from 3/32" basswood. You can use tacky or super glue to glue these on. I used an oval template for the shape, 1", 20 degree oval. I painted these black with a silver line through the middle. I also painted the shade with a silver line along the edge. A good substitution for the silver line is silver foil from a stained glass supplier. It's thin and narrow and has a sticky back. You'll have to cut it even narrower but it looks very nice, just like the metal trim used. I also used this as the edge along my counters in the kitchen room box and for the trim on my refrigerators. I want to give you a tip. I am married to an architectural woodworker, we have a shop and he makes cabinets and furniture, free standing and built into homes. When he is figuring how much wood he has to have and how to cut it out from sheets of plywood and his hardwood, he makes a "cut list". I call it his "recipe". This method saves on wood and also saves on table saw changes, especially when you are cutting 1 29/32". You don't want to have to set the saw up twice for a measurement like that! The easiest way to explain how to do this is visually, once you understand it you won't have to draw the pictures anymore. 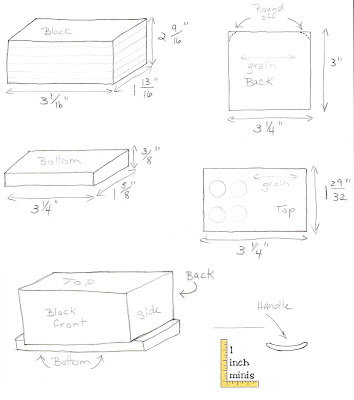 Go through the directions and draw all the pieces needed, put the measurements and which way the grain is going. Now go through and find the common measurements. When you have the saw set up to cut 3 1/4", run them all at that time. It does take some careful pre-planning, but it helps out in the long run.